U.S. President Barack Obama delivered his final major speech dedicated to his national security record, both at home and abroad over the last eight years. President Obama also highlighted how his administration has approached the threat of terrorism and how he believes the nation can pursue a successful and sustainable counter terrorism policy in the years to come. From the wars in Iraq and Afghanistan, to the emergence of ISIL, to the importance of diplomacy and global development, President Obama outlined the actions that he took as commander-in-chief and the lessons that could be drawn from this approach. Obama said the most solemn responsibility for any U.S. President is keeping the American people safe. "In carrying out that duty, I have sent men and women into harm's way. I've visited troops around the globe. I have met our wounded warriors, and I've grieved with Gold Star families. I know better than most that it is because of your service and your sacrifice that we have been able, during these eight years, to protect our homeland, to strike crippling blows against terrorist networks, and fortify our friends and our allies," he said. Reflecting on the efforts and initiatives of the last eight years, President Obama remarked, "I came to this office with a set of core convictions that have guided me as commander-in-chief. I believe that the United States military can achieve any mission and that we are, and must remain the strongest fighting force the world has ever known. I believe that we must never hesitate to act when necessary, including unilaterally when necessary, against any imminent threats to our people." However, he insisted that it was unwise and unsustainable to ask the military to build nations on the other side of the world, or resolve their internal conflicts, particularly in places where our forces have become a magnet for terrorists and insurgencies. "Instead, it has been my conviction that even as we focus relentlessly on dismantling terrorist networks like al Qaeda and ISIL, we should ask allies to do their share in the fight, and we should strengthen local partners who can provide lasting security," he said. Obama said these convictions guided the policies that his administration has pursued both in Iraq and Afghanistan. The President said that when he took office, the United States was focused overwhelmingly on Iraq, where nearly 150,000 American troops had spent years fighting an insurgency and helping to build a democratic government. Asserting that Al Qaeda had meanwhile regrouped in the border region of Afghanistan and Pakistan, and was actively planning attacks against our homeland, Obama said that they brought nearly 150,000 troops back to the U.S. from Iraq, consistent with the Status of Forces Agreement negotiated by the previous administration. "We surged our efforts along with our allies in Afghanistan, which allowed us to focus on dismantling al Qaeda and give the Afghan government the opportunity to succeed," Obama said. "And this focus on Al Qaeda, the most dangerous threat to the United States at the time has paid dividends and today, by any measure, core Al Qaeda? that hit us on 9/11?is a shadow of its former self, he added. 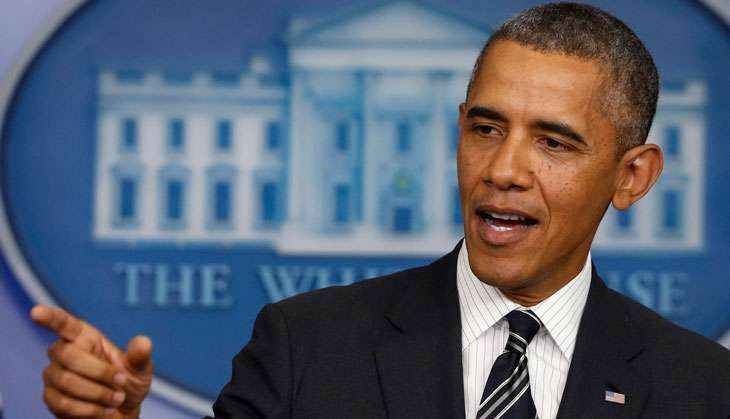 Obama said that plots directed from within Afghanistan and Pakistan has been consistently disrupted, their leadership has been decimated and dozens of terrorist leaders including Osama bin Laden are dead. He said they have built a counter terrorism capability that can sustain this pressure against any terrorist network in South Asia that might threaten the United States of America and this was because of the work of "our outstanding service members". "Moreover, that early decision to strengthen our efforts in Afghanistan allowed us to build the capacity of Afghans to secure and defend their own country. So today, there are less than 10,000 American troops in Afghanistan. Instead of being in the lead against the Taliban, Americans are now supporting 320,000 Afghan security forces who are defending their communities and supporting our counter terrorism efforts," Obama said. Obama said that they took the fight to ISIL in both Iraq and Syria, not with the American battalions but with local forces backed by our equipment and advisors and importantly, our Special Forces. "In that campaign, we have now hit ISIL with over 16,000 airstrikes. We have equipped and trained tens of thousands of partners on the ground. And today, the results are clear: ISIL has lost more than half of its territory. ISIL has lost control of major population centers. Its morale is plummeting. Its recruitment is drying up. Its commanders and external plotters are being taken out, and local populations are turning against it," he said. Obama stated that the United States of America is not a country which imposes religious tests as a price for freedom and it's a country that was founded so that people could practice their faiths as they choose. "The United States of America is not a place where some citizens have to withstand greater scrutiny, or carry a special ID card, or prove that they're not an enemy from within. We're a country that has bled and struggled and sacrificed against that kind of discrimination and arbitrary rule, here in our own country and around the world," he said. The president stated that United States is a nation which believes freedom can never be taken for granted and that each American has a responsibility to sustain it. Obama said the nation is best defined by hope and not fear. "It has been the greatest honor of my life to serve as your commander-in-chief. I thank you for all for what you've done, and all that you will do in the future. May God bless you. May God bless our troops, and may God bless the United States of America, he said.